There are lots of reasons to choose destinations. --and you didn't need visas. But they don't even touch each other! The guidebook we bought encouraged us. It was a guidebook on Nicaragua and El Salvador. 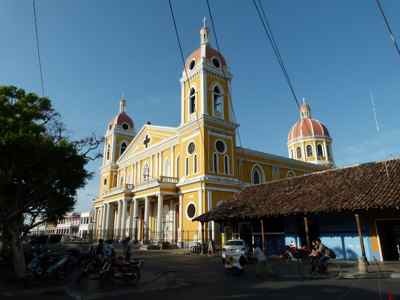 "Nicaragua and El Salvador are Central America's two least-visited countries... They may not share a border, but they do have a common tumultuous history of war, poverty, crime, and corruption. Devastating earthquakes, hurricanes, and volcanic eruptions, as well as two bitter civil wars that brought both countries to the brink, have plagued both nations." OH MY! So why go? Because, as we found, in spite of all that, both counties are full of little treasures. You can still enjoy them without hordes of tourists.... and they're very reasonably priced to travel in. For this trip, we were a little concerned with safety, and we decided independent travel wasn't the best way for us this time... but a private, custom tour would fit the bill. 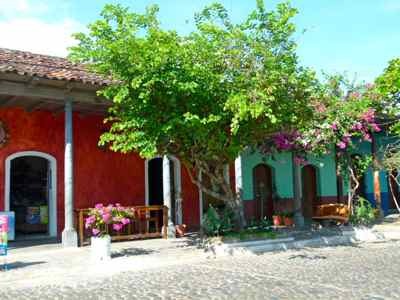 A quick search on the internet for tours to Nicaragua and El Salvador connected us with Buen Viaje Tours. There were others to choose from, but we didn't want a set tour... and the e-mail we got back made it sound like the guides we would be traveling with would make it seem like we were traveling with friends. I told Jessica we liked history and archeology and birds and nature and we had about 10-12 days... and we liked what she proposed. (Itinerary is in blue italics to set it apart from our comments. 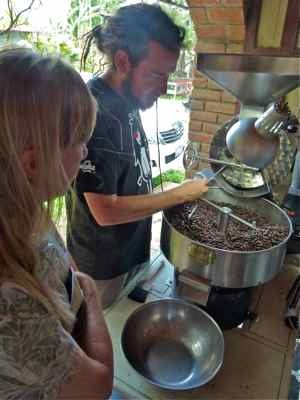 Arrive in San Salvador and travel to the little town of Juayua via Ruta de las Flores, here you will visit, and immerse yourself in, an impressive natural cascade and take a coffee tour in which you will learn how the coffee bean is picked, washed, dried and turned into a cup of fresh roast. For our trip to Nicaragua and El Salvador we had two guides. It was Jessica's associate, René, who met us in San Salvador. We did all of the above and added in San Andreas Mayan Ruins which we were driving by anyway. No problem changing the itinerary as we went. It was our custom tour after all. 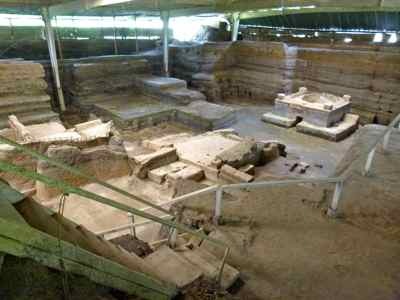 (If you add things to a tour like this, the entrance fees will be on you, not the tour operator, but that's OK with us.) We also added in a hike at Cerro Verde in Volcano National Park. Juayua has a great street fair every weekend with lots of food and artisan crafts, and we arrived on Sunday so we got to enjoy it. We'd recommend trying to set up your itinerary to arrive on the weekend. 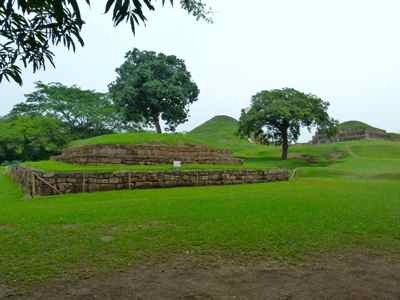 On the way to colonial Suchitoto you will visit the Mayan ruins at Tazumal as well as Joya de Ceren. 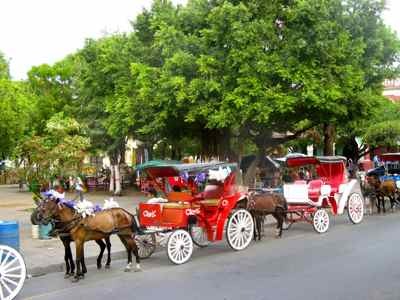 There will be a city tour through the cobble-stoned streets of Suchitoto. We also visited a dry waterfall, Cascadas Los Tercios.... what's so great about that? 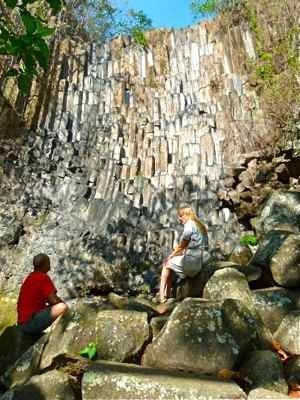 It's one of those basaltic formations where all the rocks are geometric.... pretty amazing. 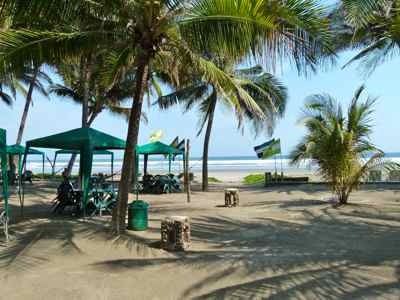 From the beach you will head to La Union, a bustling Pacific port where you will cross the Gulf of Fonseca to arrive at Potosí’s black sand beach, Nicaragua’s tranquil entry point. Here I have to send you to a whole different page on unusual boarder crossings. For now, let's just say this particular border crossing was fun... and way different than I envisioned. 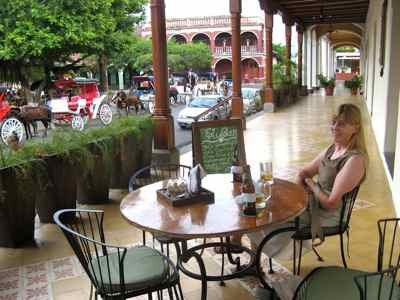 From the port town of Potosí, you will head straight to the city of León. 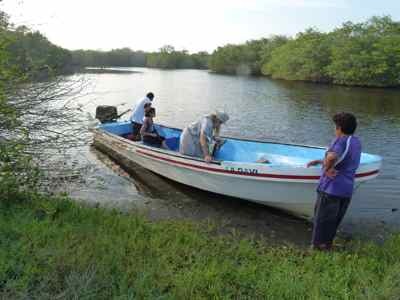 A boat ride through the mangroves will get you up close to the plethora of migratory water birds that choose Nicaragua's coastline and possibly some caiman lurking just below the water's surface. Just outside of town lies Nicaragua's extensive volcano chain. 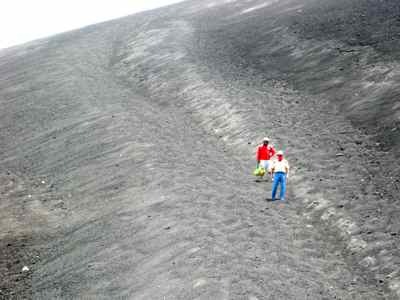 We will climb up and run down the side of one of Central America's youngest and most active volcanoes. 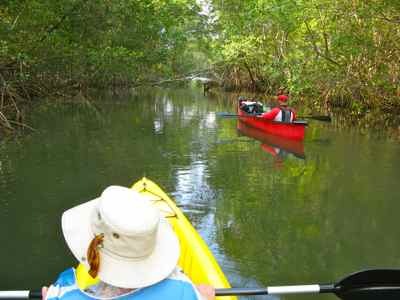 We did all that.... Nicaragua and El Salvador both have plenty of mangrove estuaries to explore. It was fun to see them in two different ways. I wasn't too sure about running down the volcano, but we did... That was a whole lot safer for us than volcano surfing, which was what others did while we were there. 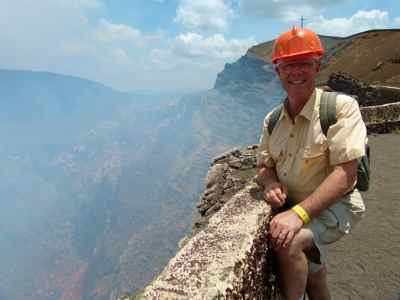 On the way to the Colonial city of Granada we will stop off at the Masaya Volcano, one of the only volcanoes in which you can walk right up to the rim and peer in. 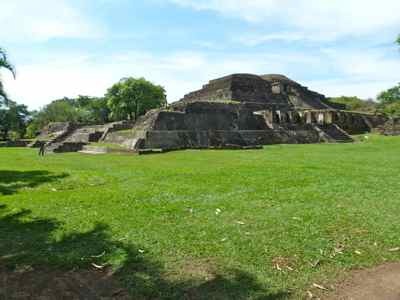 Nearby is the once fortress/prison turned historical landmark and maintained by Nicaragua's Boy Scouts. 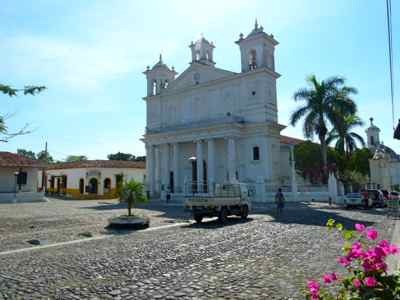 Here you will feel the weight of Nicaragua's turbulent history. 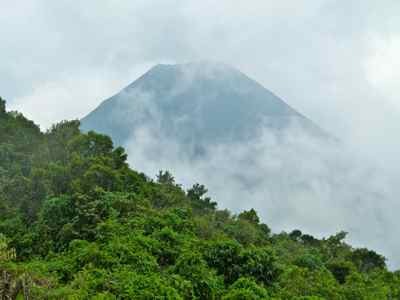 Next, a hike around the rim of the majestic Mombacho Volcano, a cloud forest home to colorful orchids and bromeliads, curious wildlife, fascinating insects, and over 160 species of birds. 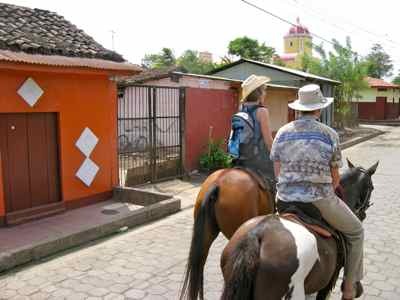 Later take a horseback ride through some of the small pueblos of Granada to a vast overlook on the rim of the crater lake, Laguna de Apoyo. 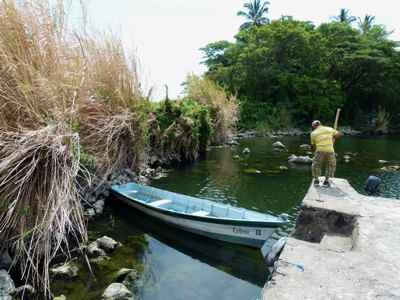 Back in Granada on the shores of Lake Nicaragua, the largest lake in Central America, we will take short boat ride to Mombacho's thermal waters and hike up through private plantain and cacao plantations for a look at what it's like to work in el campo (the countryside). Granada was a great place to end the trip... maybe the easiest city for travelers. There were actually lots of tourists and expats here. ...a great way to cool down at the end of the afternoon. We stayed in moderately priced hotels, and food was reasonably priced, so we were able to set this private, custom tour up for a price that fit our budget nicely. We found lots and lots of little treasures. And we had free time for ourselves too. Both of our guides were knowledgeable and helpful... and for us, this time, it was definitely a better trip for having locals to show us around. We followed a route and went to places that we wouldn't have on our own... driving though both countries and connecting by boat. We tried things we might not have on our own too... like the kayaking and running down the volcano. If you want to see volcanoes... Nicaragua and El Salvador both have plenty... seems like everywhere you have views of one or two! We felt perfectly safe all the time traveling with these guides who had great local knowledge and enthusiasm about their countries. Some of their tours connected us with their friends, which made it all seem very personal. Sometimes we recommend tour operators, and sometimes we don't. In this case we are pleased to tell you who we used for Nicaragua and El Salvador, but always do the research and decide for yourself what's best for you. Jessica runs Buen Viaje Tours to Nicaragua. She lives in Granada, and does both day trips and longer tours like we did. 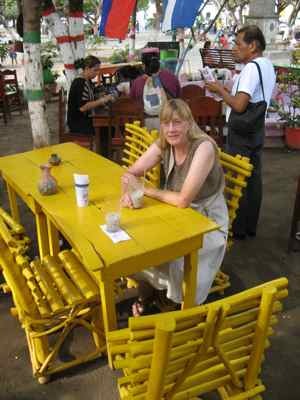 Rene lives in Suchitoto and runs Suchitoto Adventure Outfitters. He also does day trips or tours. He loves kayaking, but he was a good guide for all the other tours we went on. They work separately or together... and together, the trip they set up for us worked well.